20 mm/90 M693 on Frégate La Fayette (F 710). Marine Nationale Photograph. The 20F2 is the navalized version of the GIAT CN-MIT 20 M693 (Canon Mitrailleur 20 mm Modèle 693), formerly the Hispano-Suiza 820. This weapon is also used by the French Army. 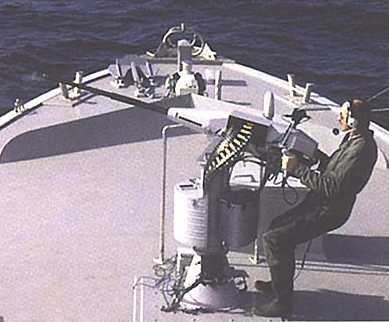 The M621 is a low-recoil gun which has been mainly used on helicopters and small aircraft, but a navalized version was developed in the late 1980s. Recoil is minimized by the use of a muzzle brake and a shock-absorbing mount. These mountings use a collimator gunsight. 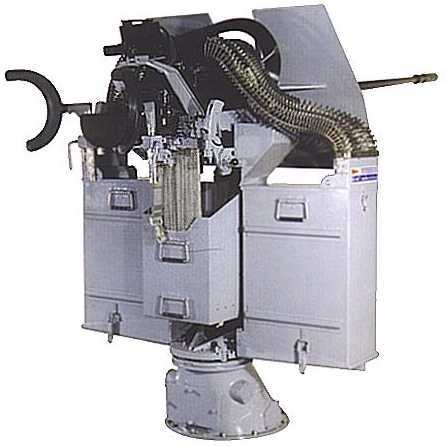 20 mm/90 M693 on Affût 15B Naval Mounting. Photograph copyrighted by GIAT and courtesy of Naval Technology. 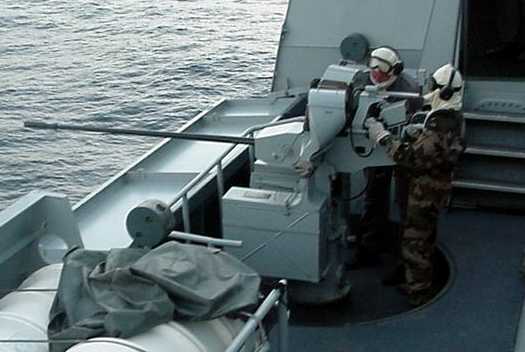 20 mm/73 GIAT M621 on Affût 15A Naval Mounting. Note the safety rail. Photograph copyrighted by GIAT and courtesy of Naval Technology.